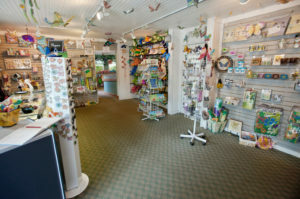 Browse our gift shop filled with unique and educational items all relating to nature, but focusing on the fascinating world of butterflies. We offer fun and educational books and toys for the kids. We also have a wide variety of merchandise for the adults in the family. From everyday souvenirs to one of a kind items you will enjoy for the rest of your life. Don’t miss our sterling silver jewelry designed with real butterfly wings and made with love by local artist Barbara Bosco, and beautiful acrylic displays using real butterflies by artist John Jurek. 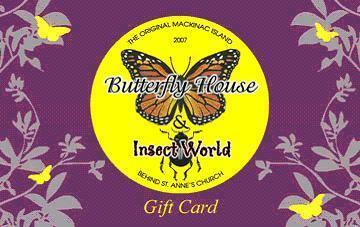 So plan a trip to The Original Mackinac Island Butterfly House. Visit our beautiful tropical garden, where our butterflies will welcome you with open “arms”. And shop in our one of a kind gift shop where you’re sure to find a gift you’ll treasure forever. Couldn’t make it to the island but want some unique butterfly merchandise or simply didn’t have enough time to shop? No problem! Thanks to our brand new online store now you can purchase our beautiful products online and have it shipped anywhere to you. Just click on the link to begin your shopping journey Online Gift Shop. Do you know someone who loves Mackinac Island? And who loves visiting the Original Butterfly House? Consider giving them a Gift Certificate! Great for Christmas, birthdays, anniversaries, and weddings! *Please note that cards cannot be redeemed for cash.